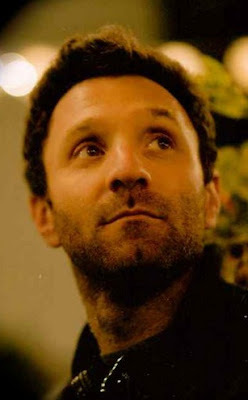 Looking for a movie in which almost everything you can predict -- so long as it is obvious and over-used -- comes to fruition? Well then, PUERTO RICANS IN PARIS should be your cup of Caribbean coffee. 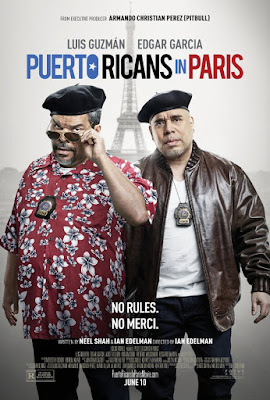 Funny only in the manner of the most been-there-done-that jokes, and using perhaps every Puerto Rican cliche known to man in exactly the way you'd expect, this new film does no favors for anyone involved. It does have a good (if wasted) cast, so it might hold your attention in that way for a time. But it might have difficulty enticing an audience with even a slightly sophisticated bone in its collective body. As co-written (with Neel Shah) and directed by Ian Edelman (shown left), the film's premise is promising: a team of NYC detectives infiltrate the Canal Street grey market in fashion accessories and make an arrest. Suddenly they're asked to head for Paris to find out who stole the prototype of a hot new handbag. Yet even in that scene in which the folk from Paris meet and ask the NY detectives for help, the film begins to plod and appear awfully amateur. Scene after scene just sits there, waiting for a some kind of goose that clever writing, directorial style and better acting chops might provide. But this never occurs. All this seems odd because, from the cast that has been assembled here, we know these performers to be solid and professional. TrustMovies has enjoyed Luis Guzmán (above, center) in supporting role after supporting role for decades now. Here, as one of the film's two leads, he proves consistently obvious and annoying. So our sympathy goes to his co-star Edgar Garcia (above, whose laid-back quality provides the film's major pleasure. While being laid-back does give us a necessary respite, this is not quite enough to make the movie worthwhile. Grossly underused on the distaff half of the American cast are a tamped-down Rosie Perez (above, as Garcia's wife) and Rosario Dawson (below, as Guzmán's current squeeze). The French side of the equation hardly fares better, as actors we've seen and enjoyed previously -- Alice Taglioni (below), for instance -- are here asked to behave mostly like idiots at half-mast. The film is full of would-be suspects -- supposedly venal co-workers and an uber-gay cliche (below, center) -- yet the handling of this is so absurd and silly that we never really care whodunit. 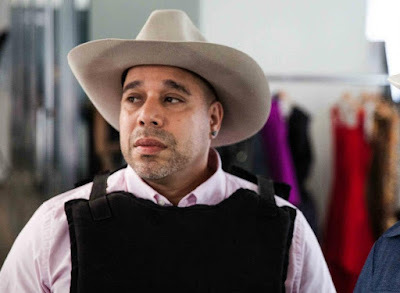 From FocusWorld and running 82 minutes, Puerto Ricans in Paris is said to be opening theatrically (if you can find a theater anywhere in the continental USA, you're doing better than I) and via VOD and Digital HD this Friday, June 10. Your move.